Chop the brown mushrooms into bite-sized pieces. 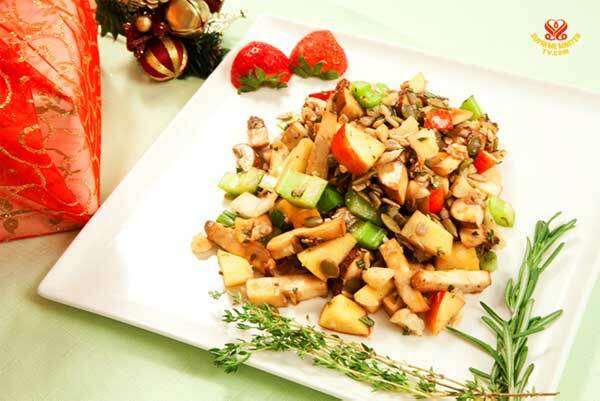 Marinate the mushrooms with 3 tablespoons of flax seed oil and 3 tablespoons of nama shoyu. Mix the mushroom and make sure that all the pieces are covered properly. Leave it marinating for 3 hours. Or else, marinate the mushroom the night before and put them in the fridge. Chop the apple, celery, and green onion into bite-sized pieces. Grind the macadamia nuts but not too fine and soak them overnight so that the enzymes are more active in the nuts. Chop the rosemary and the thyme into nice fine pieces and put them in a bowl. Mix everything together and add a pinch or two of salt and pepper. And mix again. The raw vegan stuffing is ready. Soak the 5 dates and the quarter cup of raisins for about an hour. Chop the apples into nice strips, thin but not too thin. Squeeze the lemon, and pour the juice onto the apple. This will make the apple softer like a cooked apple. Mix and let it sit for about 45 minutes to 1 hour. Pop the almonds into the food processor, and pulse it until it’s a fine powder. Take a tablespoon of the almond powder in your finger and put it onto the bottom of the pan. Add in the pitted dates into food processor, and together with the almonds continue mix them until they’re one mixture. Add a little bit of water so they’re not too dry. The texture should look like a nice doughy texture. Take the mixture out of the food processor and pour them onto the pan. Press it into the bottom. Peel the orange, and make sure there’s no seeds in it. Put the orange inside the food processor. Add in the dates that have been soaked. Add in the water, 2 teaspoon of salt, and 2 tablespoon of cinnamon. Put the lid on and pulse the food processor until it’s sauce-like texture. Dump the sauce onto the nicely marinated apples. Mix it together nicely. Take the raisins out from the soaked water, dump the water and add it to the apple mixture. Mix it nicely and put it on top of the pie crust. For garnish, put some of apple slices around the outside of the pan in sort of fan shape. The apple pie is ready.